Sheffield’s clients range from under-capitalized entrepreneurs with a dream to some of the largest and most well-capitalized companies in existence. Large or small, when new clients meet with the high-energy team based out of Scottsdale, Arizona, they immediately gain access to the “One Source Resource”. This is part of the Sheffield vision: to gather the best in synergistic client-centered benefits and services under one roof. The concept offers companies and entrepreneurs from domestic as well as international markets, a one-stop-shopping approach to fulfilling their company needs. It has been said, “There are few assets in business quite so valuable as scar tissue, although it’s generally not very pleasantly acquired.” So, if you could find someone who’s already been down the road you’re about to travel, once, twice or even three times, you could scarcely do better than to make that person your guide. But, what if you could find someone who had already traveled that road hundreds of times? What if there was an entire team of experts who had already successfully navigated the route you must follow, and who make a business of serving as guides for expeditions just like yours? Wouldn’t it make sense to put them on your team? The Sheffield Group is that team. Direct selling and network marketing are booming internationally. Many corporate owners in the United States have realized that the domestic market, even though it is still huge, has matured considerably compared to the opportunities offered in overseas territories. The successful leaders in their distributor organizations also demand that the Company offers a strategic plan and roll-out program for a true global expansion. Domestic success alone often does not satisfy the serious network marketers in America. Distributors are looking for a real global presence, and they expect to prosper both at home and abroad. the Sheffield Group has already made an impact on millions in many nations — Canada, Mexico, Australia, South America, China, Japan, Russia, and most of the European countries. The global entrepreneurial explosion and staggering innovation in new technology has led the company to develop systems and alliances that can address the new opportunities and challenges in an efficient manner. The reputation of the Sheffield Group’s President Michael Sheffield in international circles is strong. 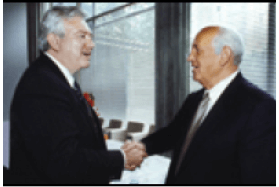 In 2000, in his role as chairman of the Multi-Level Marketing International Association (MLMIA), he was invited to a private meeting with Mikhail Gorbachev, the former president of the Soviet Union, to discuss entrepreneurship and free enterprise for the Russian people. Then, in a presentation near Moscow’s Red Square, they shared the platform to address over 4,000 independent MLM distributors in attendance from around the world along with government officials from Russia and China. According to Sheffield, “I felt I had been given a once-in-a-lifetime opportunity and it was critical that I said the right thing. I was not only representing the MLMIA and our entire industry but I was representing our country. I selected my words carefully.” The words spoken by Sheffield at this historic event were clearly popular since he received a standing ovation. 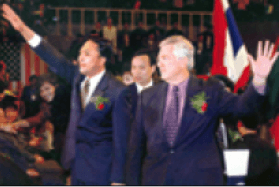 In 2000, Sheffield made history in Beijing, China by meeting with government officials and the ambassadors to China from 38 countries, including many where the concept of free enterprise is just beginning to blossom. This opportunity was made possible by one of Sheffield’s largest clients based in China where he had been invited to address several thousand of their key distributors. His message on the long and short-term benefits of multi-level marketing was received with great enthusiasm. Perhaps most importantly, for the industry as a whole, is the fact that Sheffield has built a system and a team that will allow the Sheffield Group to continue to impact millions of people worldwide in years to come.